The HTC 8X is a fantastic ambassador to Windows Phone 8, but we're longing for a similar phone running Android -- at least until a stronger app ecosystem develops. 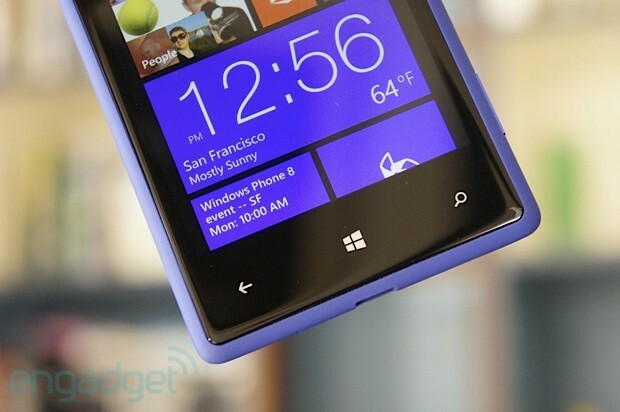 How would you rate the Windows Phone 8X? We're not going to mince words here: we're madly in love with the design of HTC's Windows Phone 8X. It combines angular lines with curves in unique and delightful ways, then adds a bucket of color to the mix. Our review unit is the global, non-LTE model in a handsome shade of purple-ish blue called California Blue (other colors include Graphite Black, Flame Red and the amazing Limelight Yellow). In the US, both T-Mobile and AT&T will be offering the handset but it's not clear if all these hues will make the final cut. 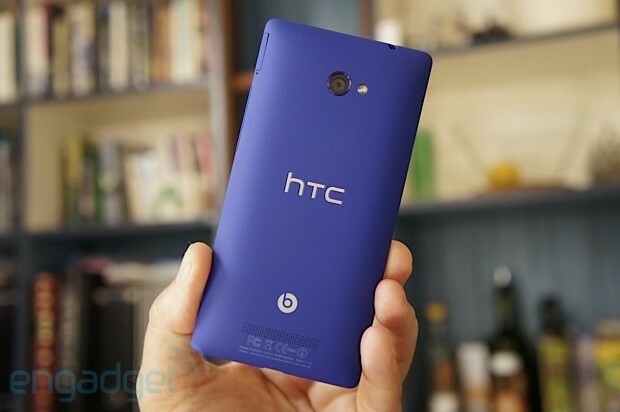 Like HTC's One X (and One X+), the 8X starts life as a solid block of colored polycarbonate. Here, however, it's machined down into something akin to a pillow -- a rectangular unibody with gently rounded corners that tapers softly to a thin edge around the device, with a sheet of black Gorilla Glass in front. While Nokia pioneered the process of machining colored polycarbonate (both matte and glossy finishes) with the N9 and the Lumia 800, HTC's pushing the envelope here with what looks like soft-touch frosted surfaces. Oh yes, except for maybe the black and white versions, people will notice this phone -- you've been warned. It combines angular lines with curves in unique and delightful ways, then adds a bucket of color to the mix. In a day and age when most flagships have 4.65- to 4.8-inch screens (or bigger -- hello, Galaxy Note II), it's refreshing to see a top-tier handset with more compact dimensions. As mentioned above, the HTC 8X is built around a 4.3-inch HD display which allows the body to be narrower and better suited for one-handed operation. The phone feels extremely comfortable in hand and features great proportions despite a generous bezel (especially at the top and bottom). At 130g (4.59 ounces) it's not a heavy device, but the sleek design does a fantastic job of hiding the thicker-than-average 10.1mm (0.4-inches) profile. The pillow-like colored polycarbonate back is flat enough that the 8X is able to rest on a table without rocking back and forth when touched. It's home to the 8-megapixel, f/2.0 autofocus camera (accented by an anodized aluminum ring in a similar shade of blue and flanked by a single LED flash) in the top center. The HTC brand is embossed in silver smack in the middle, and the Beats logo, speaker grille (an array of tiny machined holes) and certification details in fine print can be found in the bottom-center. Gorilla Glass covers the front of the 8X and tapers slightly at the edges to blend into the colored polycarbonate. While the build quality of our review unit is generally top-notch, the bottom-left corner of that glass surface is not perfectly flush with the body. This was even more pronounced on another handset, enough for light to leak out of the gap when using the device at night. Hopefully HTC will remedy this minor flaw as production ramps up. Beyond protecting the 4.3-inch, 720p panel, this sheet of glass covers the 2.1-megapixel front-facing camera (top-left) and capacitive buttons along the bottom (back, Windows and search) which are both stenciled and backlit in white. One of the most striking aspects of the 8X's design is the earpiece which matches the blue hue of the rest of the phone. We're pretty sure it's part of the machined chassis and protrudes through a cutout in the front glass. Cool, eh? A notification light is seamlessly embedded inside the earpiece -- light just shines through the right end of the grille -- and a silver HTC logo is wedged between the earpiece and the screen. One of the most striking aspects of the 8X's design is the earpiece which matches the blue hue of the rest of the phone. Walking around the surprisingly thin colored polycarbonate edge of the 8X, you'll find the standard 3.5mm headphone jack, secondary mic and power / lock key on top; the micro-SIM tray (with its obligatory release pin hole), volume rocker and dedicated two-stage camera button on the right side; plus micro-USB and primary mic on the bottom. It's worth noting that all these controls (power / lock key, volume rocker and camera button) are made of anodized aluminum in a similar shade of blue as the rest of the handset -- a lovely touch for sure. The only drawback is that these controls are super thin and almost flush with the body, making them difficult to find by touch. Since the 8X relies on a unibody manufacturing process, the 1,800mAh Li-polymer battery is sealed and there's no microSD slot. Instead, storage is provided in the form of 16GB of built-in flash -- this is a bare minimum these days and might be a sticking point for some. Regardless of these limitations, this is an exquisite design and we'd love to see HTC make a compact Android flagship with the same look and feel. The 8X's non-PenTile Super LCD 2 display crams 1,280 x 720 pixels into a 4.3-inch diagonal -- that's 341ppi of HD goodness, if you're keeping track. It's also optically laminated to the glass surface for more sharpness and less reflections. All this results in a gorgeous screen with inky blacks and natural colors that's bright enough to handle direct sunlight. Strangely, the viewing angles don't quite match what we've experienced with the One X, despite both phones sharing the same panel technology. We're being picky here, to be sure, and most people will be hard-pressed to notice a difference. The 8X's Super LCD 2 display crams 1,280 x 720 pixels into a 4.3-inch diagonal -- that's 341ppi of HD goodness, if you're keeping track. Spec-wise, the 8X features a 1.5GHz dual-core Qualcomm Snapdragon S4 SoC paired with 1GB of RAM. This is a huge improvement over Windows Phone 7 devices which are limited to a single core processor and 512MB of RAM. As we pointed out above, there's 16GB of internal flash with no way to add more -- while Windows Phone 8 supports microSD storage, HTC chose to do without. Our global review unit sports quad-band radios for both GSM / GPRS / EDGE and UMTS / HSPA+ (the latter compatible with 2100, 1900, 900 and 850MHz), but some upcoming models (like AT&T's) will also provide LTE functionality. Additional radios include 802.11a/b/g/n (dual-band), Bluetooth 2.1 + EDR, A-GPS and NFC. Finally, you'll find the usual collection of sensors on board: proximity, ambient light, compass, accelerometer and gyroscope. We're particularly blown away by that 914ms SunSpider score. It should come as no surprise that Windows Phone 8 paired with a modern dual-core processor driving a 720p display feels just as snappy and responsive as Windows Phone 7 running on a single-core CPU with a WVGA screen. We've always been satisfied with the subjective performance of Windows Phone 7, and this continues with Windows Phone 8. On the one hand, the raw benefits of using faster silicon are likely offset by switching from Windows CE to the Windows NT kernel. Then again, the new OS architecture brings significant benefits to the table, such as better multitasking, enhanced security and a common set of APIs for developers. 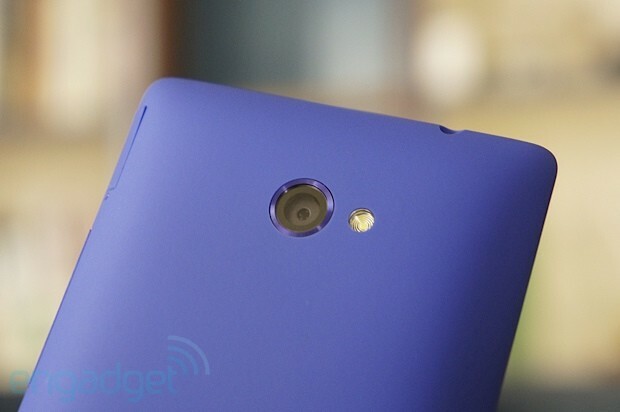 We put the HTC 8X through our usual set of benchmarks and the results are rather interesting. Keep in mind that WPBench and AnTuTu are Windows Phone 7 apps that might not work properly in Windows Phone 8. Still, this device is clearly much quicker than any other Windows Phone handset we've tested before. We're particularly blown away by that 914ms SunSpider score. Calls sounded loud and clear on the 8X, both with the earpiece and the speaker. Ditto for music playback through headphones and earbuds, which demonstrated the same impeccable audio quality we documented with the One X. The company is obviously putting an emphasis on the listening experience with its phones lately, and it's paying off. Reception was problem-free and our HSPA+ speed tests peaked at 8 Mbps down and 1.5 Mbps up, which is pretty much what you'd expect from an unlocked handset on AT&T's network in San Francisco. Devices built around Qualcomm's dual-core Snapdragon S4 usually provide superior battery life and the 8X is no exception. Even though WPBench's CPU-intensive battery rundown test drained the sealed 1,800mAh Li-polymer pack in just two hours and 30 minutes (with the display turned on), we're taking this result with a grain of salt since we're dealing with a Windows Phone 7 app. In our normal battery usage test, we easily managed to extract an entire day's use from a full charge, and we think most folks will have no trouble replicating this. If you're familiar with the impressive camera found on the One X (and One S) you'll feel right at home with the 8X. If you're familiar with the impressive camera found on the One X (and One S), you'll feel right at home with the 8X. This shooter combines the same 8-megapixel backside-illuminated sensor, f/2.0 wide-angle autofocus lens and ImageChip technology as its Android cousins, and performs just as nicely. What's lost in the shuffle are some of HTC's ImageSense tricks, such as the ability to capture stills while recording video, plus the burst, HDR and panorama modes. Instead, you're treated to a basic camera interface which looks pretty much identical to what we last saw in Windows Phone 7. Here you'll find a double-arrow icon for a new feature called Lenses, which are plug-ins designed to extend the shooter's functionality. It's likely that HDR and panorama will eventually return as Lenses, but for now there are three to choose from. Bing Vision (pre-installed) scans barcodes, QR codes, Microsoft tags, books, CDs and DVDs. Photosync shoots wraparound panoramas or full synths, such as 360-degree views. PhotoStrip mimics a photo booth by taking five pictures, one second apart (this is adjustable) and combining them into a strip. This camera takes wonderful photos, with plenty of detail. Color balance and exposure are extremely accurate even in the most difficult conditions. Low-light performance is strong thanks the fast f/2.0 lens and backside-illuminated sensor -- noise, while sometimes noticeable, rarely becomes an issue. It's also the fastest Windows Phone shooter we've used yet, although there's still room for improvement with the autofocus speed when taking closeup shots. Video is captured in HD at 1080p / 30 fps with mono audio, continuous autofocus and an average bitrate of 20.5 Mbps -- unfortunately this drops to 15 fps when recording at night. The results are generally decent, but low-light video performance is rather disappointing. Like all Windows Phone handsets, the 8X comes with a dedicated two-stage camera button which locks focus and exposure when half-pressed. While this key is a bit too narrow and too flush with the edge of the phone, it's still better than nothing -- Android manufacturers, take note. Still, coming from Windows Phone 7, this new OS feels like an evolution, like yet another minor version bump. We're not going to get into the details of what's new with Microsoft's latest mobile OS -- that's what our ultra-thorough Windows Phone 8 review is for. Still, coming from Windows Phone 7, this new OS feels like an evolution, like yet another minor version bump. Of course, there's a lot more going on under the hood, changes that should allow Windows Phone 8 to grow and mature. The seeds are planted, but will they blossom? That really depends on how this mobile OS is received by developers. Case in point: seamless Google integration, or the lack thereof -- it's impractical for most of us at Engadget to use a Windows Phone handset as our daily driver. There's no way for us to do our jobs without proper support (including notifications) for advanced Gmail features, multiple private Google calendars, Google talk and Google Voice. Even the latest Twitter and Facebook clients are eons behind what's available in Android or iOS -- not to mention the lack of official apps for Google+, Google Music, Instagram, Dropbox, Flipboard, Uber and Square, to name but a few. HTC does provide a few in-house apps and additional settings on the 8X but these look identical to what the company previously bundled on its Windows Phone 7 devices. There's an app simply called HTC which aggregates up-to-date weather, stocks and news along with a matching Live Tile. Connection Setup helps with APN configuration: select your country and carrier and the app handles the rest. Flashlight is exactly what you'd expect -- it turns the LED flash on the back of the handset into a torch with three levels of brightness. Photo Enhancer lets you apply filters to existing pictures complete with an Auto Enhance option. Converter offers a quick and easy way to convert between various units and currencies. 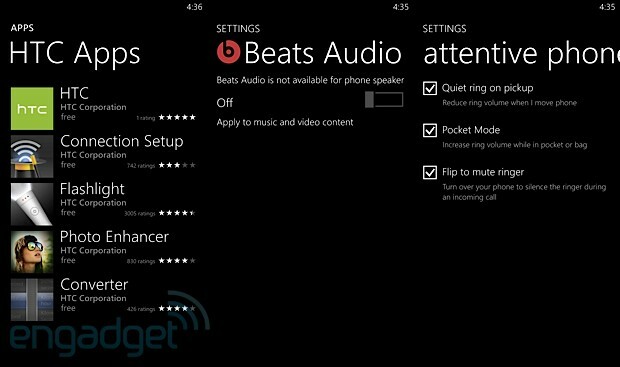 The 8X also gains a couple of entries in the settings menu with a Beats Audio switch and the "attentive phone" toggles (Quiet ring on pickup, Pocket Mode and Flip to mute ringer). There's no doubt that HTC's Windows Phone 8X is a worthy flagship. It combines phenomenal looks, solid construction and high-end specs in a relatively compact and delightfully colorful package. We're impressed with the speedy Qualcomm dual-core Snapdragon S4, great battery life, beautiful 4.3-inch 341ppi Super LCD 2 screen and strong 8-megapixel camera. Yes, the 8X is a fantastic ambassador to Windows Phone 8, but after using it for several days, we're longing for a similar phone from HTC running Android -- at least until a stronger app ecosystem develops for Microsoft's latest mobile OS. Still, if you're betting on Windows Phone 8 it really comes down to the 8X's exquisite design and reduced footprint versus the Lumia 920's better camera, larger screen and wireless charging. Which one's right for you? Stay tuned for our upcoming review of Nokia's flagship. Update: We've also spent time with AT&T's version of the HTC 8X, and taken a look at the differences right here.